Fashion style is not limited. Here, we will suggest to you 3 stylish combination of khaki outfit. 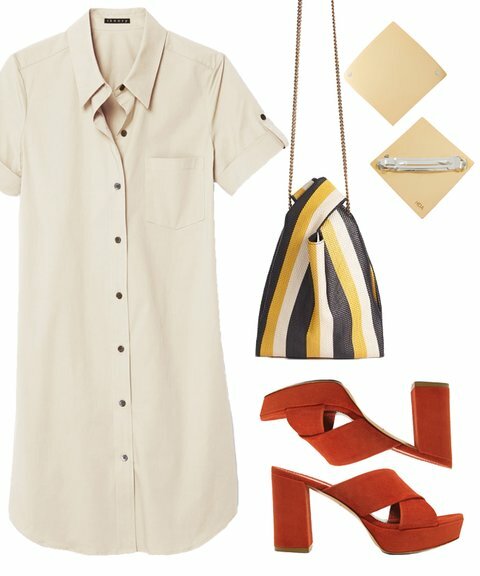 Double down on khaki&apos;s inherent safari vibe with a cotton poplin shirtdress. Rust-colored suede heels and a striped oven bag continues the far-flung feel, while a diamond-shaped gold hair clip lends a polished touch. Shop the look: Theory dress, $295; theory.com. Sylvain Le Hen hair clip, $70; stevenalan.com. Stella McCartney bag, $1,750; saksfifthavenue.com. Mansur Gavriel shoes, $625; net-a-porter.com. A wrap midi skirt is naturally feminine. Up the sporty-but-glam vibes with a white sequined bomber and a fitted bodysuit. Striped neutral sandals and hammered silver hoops complete the look. Shop the look: Zara skirt, $70; zara.com. Tibi bomber, $875; shopspring.com. Boohoo bodysuit, $16; boohoo.com. Simon Miller x Rebecca Pinto hoops, $310; simonmillerusa.com. Loeffler Randal sandal, $395; loefflerrandall.com. Preppy with a twist is what we call this look. Wide-leg high-waist trousers are far more sophisticated than boxy pleated khaki pants. Marry with nipped-in gingham blazer for schoolboy vibes, but up the fun with fringed ruffle pink sandals and a structural cuff. 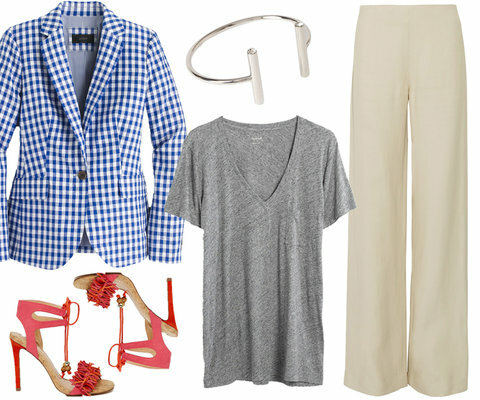 Shop the look: Adam Lippes pant, $765; net-a-porter.com. J. Crew blazer, $178; jcrew.com. Madewell tee, $20 (originally $25); madewell.com. Forever 21 cuff, $6; forever21.com. Miss KG heels, $161; asos.com.